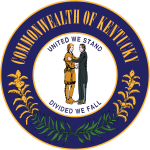 The Commonwealth of Kentucky has 29 official state emblems, as well as other designated places and events. The majority are determined by acts of the Kentucky General Assembly and recorded in Title I, Chapter 2 of the Kentucky Revised Statutes. The state's nickname – "The Bluegrass State" – is traditional, but has never been passed into law by the General Assembly. It does, however, appear on the state's license plates. Despite the nickname's popularity, the General Assembly has not designated bluegrass (or any other grass) as the official state grass. The first symbol was the Seal of Kentucky, which was made official in 1792. The original seal also contained the future state motto. It served as the state's only emblem for over 130 years until the adoption of the state bird in 1926. Enacted by law in 2010, the newest symbols of Kentucky are the state insect, the honey bee, and the state sports car, the Chevrolet Corvette. "Kentucky's State Symbols". Kentucky Department for Libraries and Archives. Archived from the original on July 31, 2007. Retrieved August 30, 2010. ^ "Kentucky Revised Statutes: Title I, Chapter 2". Kentucky Legislature. Retrieved September 1, 2010. ^ "State flag" (PDF). Legislative Research Commission. Retrieved 2007-07-03. ^ a b "State Motto". Kentucky Secretary of State. Archived from the original on August 15, 2012. Retrieved August 30, 2010. ^ "State Nickname". Kentucky Secretary of State. Archived from the original on August 15, 2012. Retrieved August 30, 2010. ^ "State seal" (PDF). Legislative Research Commission. Retrieved July 3, 2007. ^ "Viceroy". Butterflies and Moths of North America. Montana State University. Archived from the original on September 9, 2010. Retrieved August 31, 2010. ^ "State butterfly" (PDF). Legislature of Kentucky. Retrieved August 30, 2010. ^ Kleber, John E. (1992). The Kentucky Encyclopedia. Lexington, Kentucky: University Press of Kentucky. p. 321. Retrieved August 30, 2010. ^ "State flower" (PDF). Legislature of Kentucky. Retrieved August 29, 2010. ^ "State fruit" (PDF). Legislature of Kentucky. Retrieved August 30, 2010. ^ "Distribution of registered US foal crop by state". The Jockey Club. Retrieved August 30, 2010. ^ "State horse" (PDF). Legislature of Kentucky. Retrieved August 29, 2010. ^ "State agricultural insect" (PDF). Legislature of Kentucky. Retrieved August 30, 2010. ^ "State wild animal game species" (PDF). Legislature of Kentucky. Retrieved August 30, 2010. ^ "Brachiopods". Kentucky Geological Survey. Archived from the original on 2011-08-05. Retrieved August 30, 2010. ^ "State fossil" (PDF). Legislature of Kentucky. Retrieved August 30, 2010. ^ "Pearl--Kentucky's State Gemstone". Kentucky Geological Survey. Archived from the original on 2011-07-20. Retrieved August 31, 2010. ^ "State gemstone" (PDF). Legislature of Kentucky. Retrieved August 30, 2010. ^ "U.S. Coal Production by Coal-Producing Region and State". U.S. Energy Information Administration. Retrieved August 31, 2010. ^ "State mineral" (PDF). Legislature of Kentucky. Retrieved August 29, 2010. ^ "State rock" (PDF). Legislature of Kentucky. Retrieved August 29, 2010. ^ "State soil" (PDF). Legislature of Kentucky. Retrieved August 30, 2010. ^ "State drink" (PDF). Legislature of Kentucky. Retrieved August 29, 2010. ^ "State dance" (PDF). Legislature of Kentucky. Retrieved August 28, 2010. ^ "Ability to Speak English by Language Spoken at Home for the Population 18 Years and Over". U.S. Census Bureau. Retrieved August 31, 2010. ^ "State dance" (PDF). Legislature of Kentucky. Retrieved August 30, 2010. ^ Harrison, Don (June 2008). "Old-Time Man". Virginia Living. pp. 55–57. ^ "State music" (PDF). Legislature of Kentucky. Retrieved September 1, 2010. ^ "State musical instrument" (PDF). Legislature of Kentucky. Retrieved August 29, 2010. ^ "State silverware pattern" (PDF). Legislature of Kentucky. Retrieved August 29, 2010. ^ "Gov. Beshear ceremonially signs House Bill 104". Governor of Kentucky. Retrieved September 2, 2010. This page was last edited on 19 December 2018, at 01:34 (UTC).